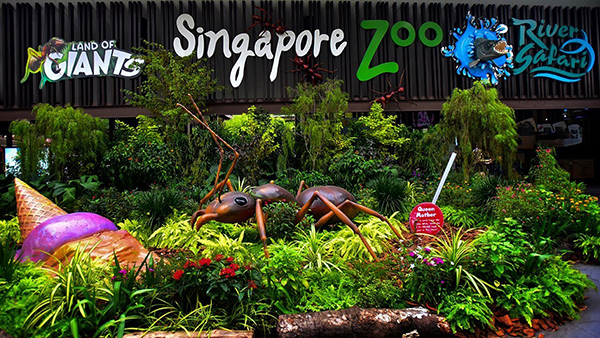 Singapore Zoo followed the modern trend of displaying animals in naturalistic, ‘open’ exhibits with hidden barriers, moats, and glass between the animals and visitors. It houses the largest captive colony of orangutans in the world. 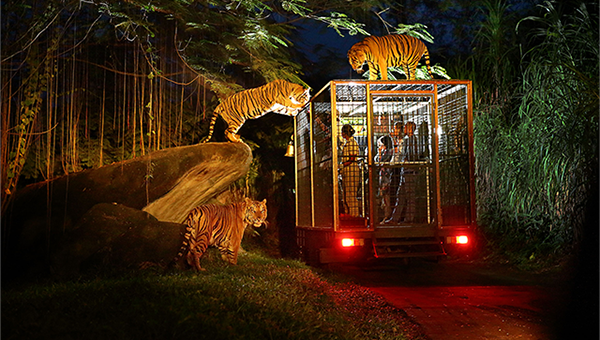 There are about 315 species of animal in the zoo, of which some 16% are considered threatened species. The zoo attracts about 1.6 million visitors each year. “Breakfast with an Orangutan” lets visitors to meet and interact closely with the orangutans in the zoo. The “Rainforest Fights Back” show is housed in the Shaw Amphitheater, the main amphitheater within the zoo. The “Elephants at Work and Play” show demonstrates how elephants are used as beasts of burden in south-east Asian countries. The “Splash Safari” show showcases the zoo’s aquatic mammals and birds. Seals and sea lions perform tricks and pelicans demonstrate how they catch fish in their beaks, while dolphin swim in the pond below. The “Animal Friends” show, housed in the Kids world amphitheatre in the zoo’s children’s section, features mostly domesticated animals such as dogs and parrots performing tricks.